Enterprise networks are evolving. Businesses today are demanding speed, scale, and connectivity that yesterday’s network architecture simply can't deliver. The challenge is that most enterprise networks are made up of a broad mix of hardware, software, and virtualized components that can make delivering the promise SDN seem out of reach. 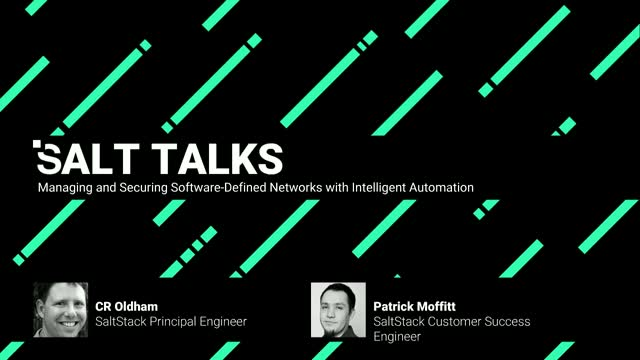 In this webinar, SaltStack Principal Engineer C.R. Oldham and SaltStack Customer Success Engineer Patrick Moffitt will detail how network and IT professionals use SaltStack to manage and secure massive networks and apply SDN best-practices. See "Attachments" under video player for resources and links. Alex Peay, SaltStack VP of product, gets to meet with IT and security teams of all shapes and sizes. When he asks these teams how they maintain security and compliance, the usual response involves a mix of disconnected systems, processes, and priorities that typically deliver less-than-satisfactory outcomes. Why is the de-facto state of securing IT infrastructure often so misguided and unnecessarily painful? Join Alex as he outlines a plan to help even the most tortured IT and security teams escape from Compliance Hell. This webinar will include tips and best practices that any organization can apply—plus a look at SaltStack SecOps, a new solution for continuous compliance detection and remediation at any scale or complexity. As business technology evolves, so must the security compliance policies designed to protect business from emerging threats. IT operations and security teams must work together to define, adopt, and implement compliance policies that are both programatic and sustainable. Join Ryan Spelman, Center for Internet Security (CIS) Sr. Director, and Brandon James, Sunayu CEO, for a SaltStack-moderated discussion on the evolution of IT compliance. Together we will explore how businesses can balance compliance and innovation in the era of digital transformation. Join Mehul Revankar, SaltStack Sr. Product Manager, and Kendall Lovett, SaltStack Sr. Product Marketing Manager, as they discuss SaltStack SecOps, a powerful solution that harnesses SaltStack’s event-driven automation technology to deliver full-service, closed-loop automation for IT system compliance and security. With SaltStack SecOps, security professionals and IT operations teams can work together to define a compliance policy, scan all systems against it, detect issues, and actively remediate them—all from a single platform. Attend this 30-minute webinar to learn how the network team at IBM Cloud uses SaltStack event-driven automation to increase operational efficiency, enhance visibility into current state, streamline deployments, and to proactively and reactively secure network infrastructure. Cisco, a primary networking vendor for IBM Cloud, will join the webinar to share its contributions to the project's success through a native integration between Cisco NX-OS and SaltStack network automation. Learn how an event-driven approach to software-defined networking provides unparalleled control and security at scale for enterprise network operations teams. Real-world systems are inherently complex. This is continually more apparent in the digital ecosystems that run modern business. The challenge to control, optimize, and secure these digital systems is becoming more and more daunting for IT operations teams. We must recognize and embrace emerging patterns to help efficiently manage infrastructure at scale. On this 30-minute webinar, Mike Place, SaltStack director of engineering and maintainer of the Salt open source project, will provide an introduction to an event-driven approach for systems management, blending traditional monitoring and configuration management techniques to build resilient and autonomous systems. The goal -- to learn how to abstract infrastructure command and control through event-driven IT automation workflows sophisticated enough to wrangle the complexity of the modern data center. This webinar will provide an overview and demonstration of the new SaltStack Enterprise 5.5 product and explore how it is used by enterprise IT teams to intelligently orchestrate, manage, and secure hybrid IT environments. For the first time ever, see how you can manage and orchestrate every SaltStack job through a single, unified command and control console. IT operators today are tasked with controlling and securing complexity at a scale never experienced before. Hybrid cloud infrastructures, heterogeneous application stacks, and sprawling software-defined networks have become the new normal. SaltStack is unique in delivering intelligent, event-driven IT automation. Attend this webinar to witness the combined power of SaltStack orchestration, automation, and configuration at scale for use cases like autonomous control of system configuration drift, or for automating pesky NOC maintenance tasks. Learn how truly intelligent IT automation can make your IT ops team more effective and your digital business more competitive. This webinar will demonstrate how SaltStack can be used to intelligently orchestrate, manage, and secure hybrid IT environments. Learn why SaltStack ITOps is unique in delivering intelligent, event-driven IT automation. Attend this webinar to witness the combined power of SaltStack orchestration, automation, and configuration at scale for use cases like autonomous control of system configuration drift, or for automation of pesky night ops tasks. Learn what event-driven IT automation can do to make your IT ops team more effective and your digital business more competitive. Join this live panel discussion with experts at VMworld US for all things virtual and cloud networking; from security, network virtualization and beyond. This live panel will be streamed directly from VMworld US in Las Vegas! Join us for live Q&A from the comfort of your desk. SaltStack develops intelligent IT automation software for the control, optimization, and security of complex digital business infrastructure at scale. This channel offers two, 30-minute webinars per month that include product demos, guidance on enterprise IT systems management topics, and SaltStack product innovation. If you are a DevOps engineer, site reliability engineer, data center or cloud architect, IT security and compliance pro, an IT executive, or an IT operator, this channel will open your mind to a unique and powerful, event-driven approach to IT systems management.